Arriving home from sixth form, I was finally greeted with this beauty - after trying to get my hands on it since it launched, I couldn't wait to try it out. When I heard that Naked 3 was going to be launching I couldn't wait to see how Urban Decay were going to give u 12 completely new neutral shades and one thing for sure is they didn't fail. Naked 1 was very warm and gold toned whilst Naked 2 was also quite warm but with more taupe shades; however, this time round Urban Decay have given us an array of rose-gold hues. The shades in this palette range from 'gorgeous pearls to glimmering metallics' and are perfect for day to night wear. The Naked 3 comes in the same case as the Naked 2 ensuring its sturdy enough to carry around with you - perfect for travelling. It also comes with a double-ended Good Karma Shadow & Blending Brush and an Eyeshadow Primer Potion sampler of all 4 of the UD primers giving you the perfect opportunity to try before you buy. 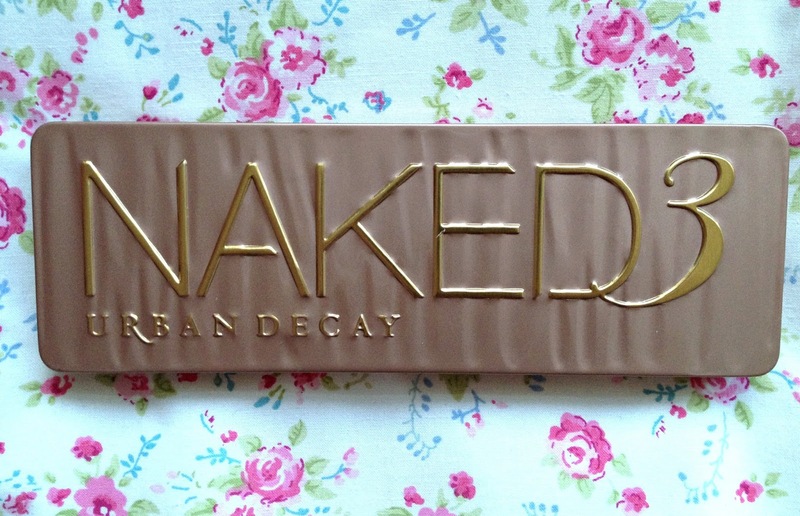 This palette is available from most Urban Decay stockists for £37 which is quite reasonable for what you get. If you already have the Naked 1 and 2, you may not need this palette but then again no girl can have too many eyeshadow palettes!